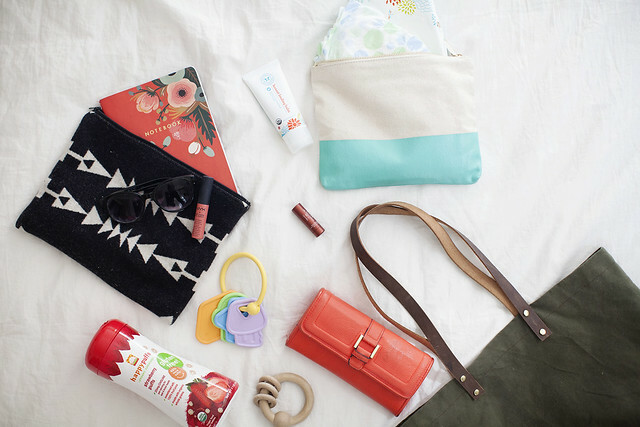 vanilla & lace: What's in my [diaper] bag? 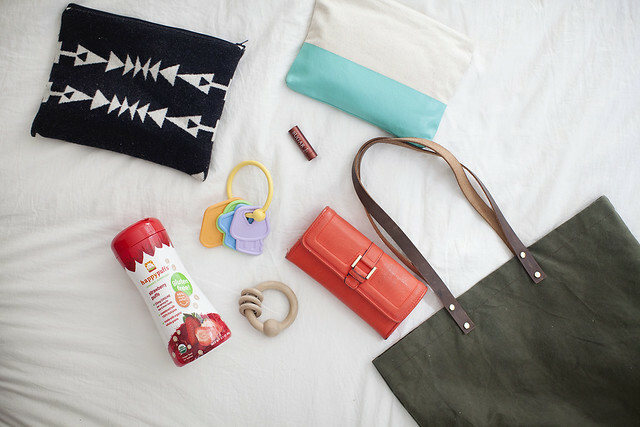 Are the 'What's in my bag?' posts cool anymore? They were always a favorite of mine to read back in the day and every now and then I see one pop up and I get excited. 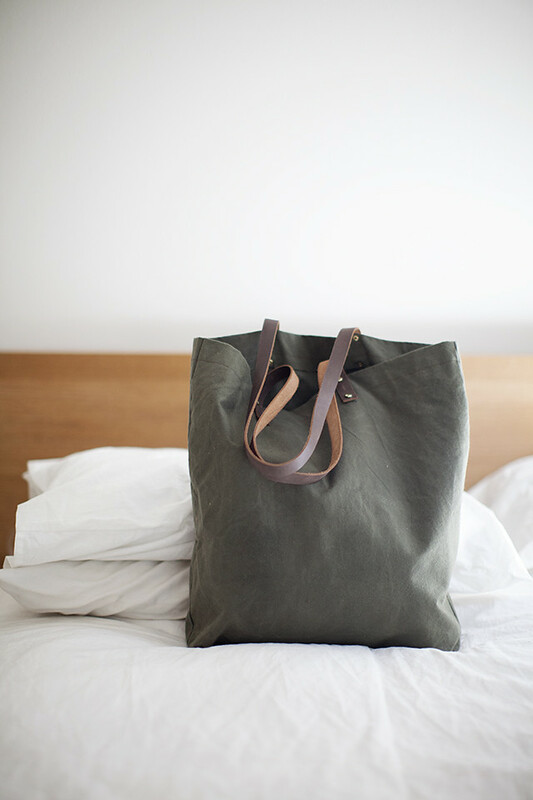 Maybe I'm just nosey but I like seeing what people keep in the bags they tote around every day. So here's mine. I obviously change things up from time to time like which lipstick I keep on me and extra baby things depending on how long we're gone but this is what it looks like most of the time. Since I'm using a large bag with no pockets I keep most everything tucked into a few clutches to keep it all organized. One for baby stuff: Wipes, diapers and cream/lotion. 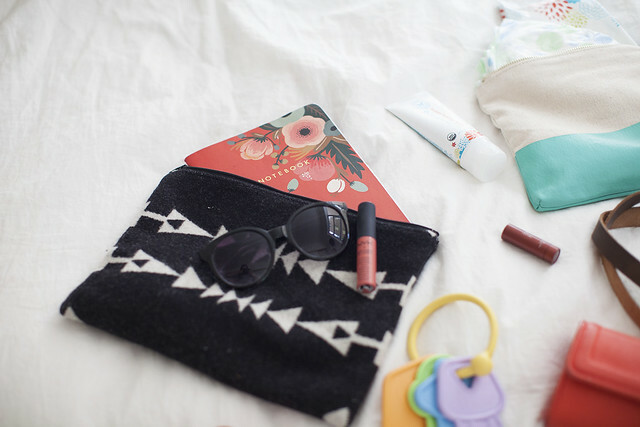 One for essentials: notebook, sunglasses, lipstick, ect. The toys, baby puffs, chap stick and wallet float freely since I use them the most. Also, the tote. I know I shouldn't brag about something I made for myself but I love it. Super durable and fits everything I need with room to spare. I'm excited to get them up on my store for pre-orders in the next couple weeks. 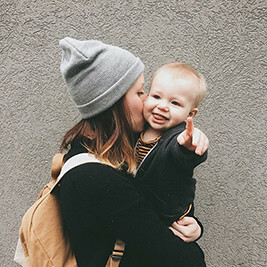 I always keep an extra outfit and a little first aid kit since I have a toddler and you never know what he's going to do. I was going to ask there the bag was from, I can't believe you made it! I so want one! I currently carry my purse AND a diaper bag! (We cloth diaper, so if we are on a long outing, the diapers pretty much need their own back.) But I would love to have just one bag to carry everything in. You totally should brag about this bag you made because it is fabulous! One more thing I suggest keeping in your bag is an extra outfit, that's one thing I would forget to pack on short outings but boy did I regret it a few times! I love posts like this! Yes, what's in my bag posts are the coolest. Or I'm just super nosey. I'm impressed at how simplified and organized your bag is; love it. And yes, brag away. That bag is great! I love that black and white zipper pouch!! Where from? ?